Saturday I took the kids to Potomac Overlook Regional Park, to help with a community service project that our preschool helps with every year. We had a great time pulling up periwinkle that had taken over a garden bed. I brought the hoematic, and I was madly chopping up a mat of greenery with it. CRUNCH! The hoematic smacked somthing plasticky and metallic. 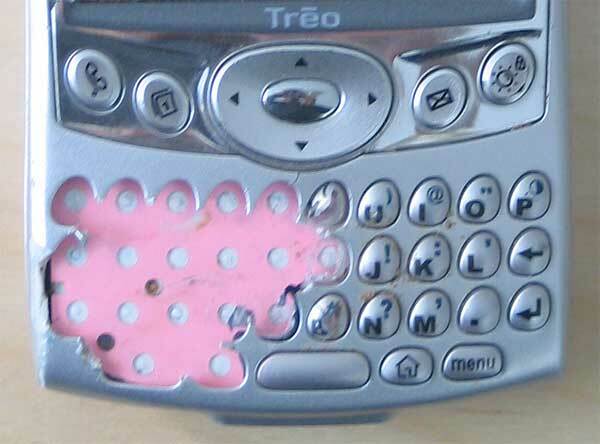 Lying in the garden bed was my Treo 600 smartphone, with a big gash across the front. The screen doesn’t really work anymore, but it can originate and receive cell phone calls in this state. It’s possible to hit the keys with the stylus when the keytops are peeled back like this. This killed my immediate enthusiasm for the gardening project, but I’ll probably be back next year. Maybe I should get a snap sewn into the cell-phone pocket of the jeans I was wearing, too. I am amused – nice photos. I’m able to laugh at this pain-free as a) I lack a cell phone, b) live in a condo – making me gardening immune.